The Bucs UK Fan Club was formed in December 1984 with an initial six members. Since that date, we have been officially recognised by the Buccaneer franchise and have enjoyed huge support and a fantastic working relationship with them for which we continue to be grateful. Bucs UK membership is by annual subscription and members are entitled to take part in regular club events and competitions, as well as book game tickets and join in the regular club trips to Tampa. Non-members are welcome to join our message board and join in the discussions and game threads. Go Bucs! 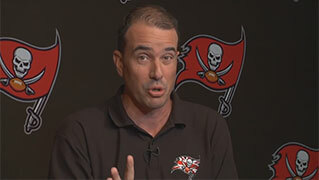 Video: Thanks to 'Bucs sideline guy' TJ Rives for wearing our Bucs UK members' polo shirt in an edition of Pewter Panel on Buccaneers.com and for giving us a mention. We love you TJ! Video: In 2015 the Bucs UK headed to New Orleans to follow the Bucs to their away game. We stayed at the Players' Hotel, and Club President Phil Jones was interviewed by Casey Phillips and Scott Smith for Buccaneers.com Insider Report. Video: As part of our Annual Awards, the Bucs UK vote for their favourite players and contributors. 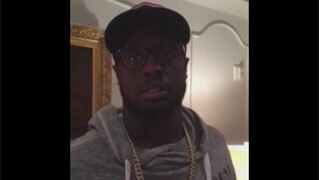 The 2014, Buccaneer of the Year Award went to Gerald McCoy. He was kind enough to record this video in thanks. We love you Gerald! 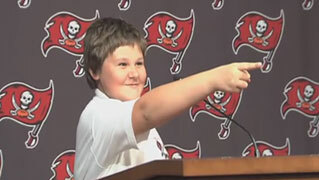 Video: In 2011 the Bucs UK headed to Tampa for a home game against the Houston Texans. The trip included a guided tour of One Buc Place and a chance to meet Jimmie Giles, a trip to Bucs & Bulls Heaven and dinner at Selmon's. Video: In 2009, to welcome the Bucs first trip to Wembley, the Bucs UK held a game of touch football against the Pats UK fans. We won - not least because Lee Roy Selmon, Mike Alstott, Shelton Quarles and Captain Fear turned up to help!